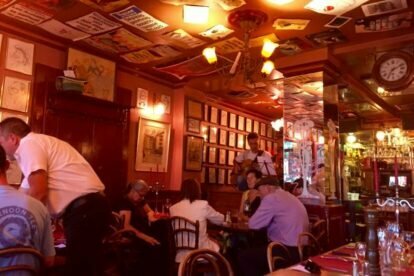 The Café du Bourg de Four might defeat your expectations: while I would typically never frequent a restaurant located right next to a major tourist attraction, the Café du Bourg de Four, just a stone’s throw away from the Cathédral de Saint Pierre and the world’s longest bench, is one of the most traditionally charming restaurants in town, and serves the best rösti – with a twist. Entering the restaurant is a bit like entering a time capsule: open since 1874, local legislators and politicians who work down the street have dropped in here for lunch for decades. Their legacy lines the walls now, in the form of cartooned portraits, mixed in with local news covers throughout the restaurant’s history. The owners of the day are Swiss with ex-Yugoslavian roots, and the menu embraces their mixed heritage: a true illustration of contemporary Geneva. Rösti, a kind of large potato pancake typical of Germanic Switzerland, is crispy on the outside, moist on the inside. The twist is to order the cevapcici rösti menu, which includes a starter of a Serbian Salad, followed by a main course of Serbian beef meatballs or sausages with raw onions and a side of rösti. Alternatively, the plain rösti with a fried egg and ham or bacon on top is another classic. (Better known to Brits and Americans as breakfast for dinner). And if you can make it on a Tuesday eve, you’ll be rewarded with the Araoz trio of guitarists serenading the joint with jazz standards.